Artist’s conception entitled the “Splatt Theory” (by Ardeth Anderson). We now think that the dead at Ban Chiang were buried under and around houses that were built on stilts. This practice—found in many societies from the ancient Maya to the Near Eastern neolithic—is called “residential burial.” The primary evidence of this practice from Ban Chiang excavations is that post holes and burials intercut each other. Instead of separating the dead from the living, these realms must have been closely entwined. Perhaps this practice was done for the living to keep a close physical relationship to their deceased relatives and ancestors. The reinterpretation is opening up new ways of thinking about the prehistoric societies of Thailand, with greater emphasis on long-lived communities, ritual integration of societies, and how this social structure encouraged low levels of violence and social stratification. Making sense of the remains of daily life is a particular challenge for a site like Ban Chiang. 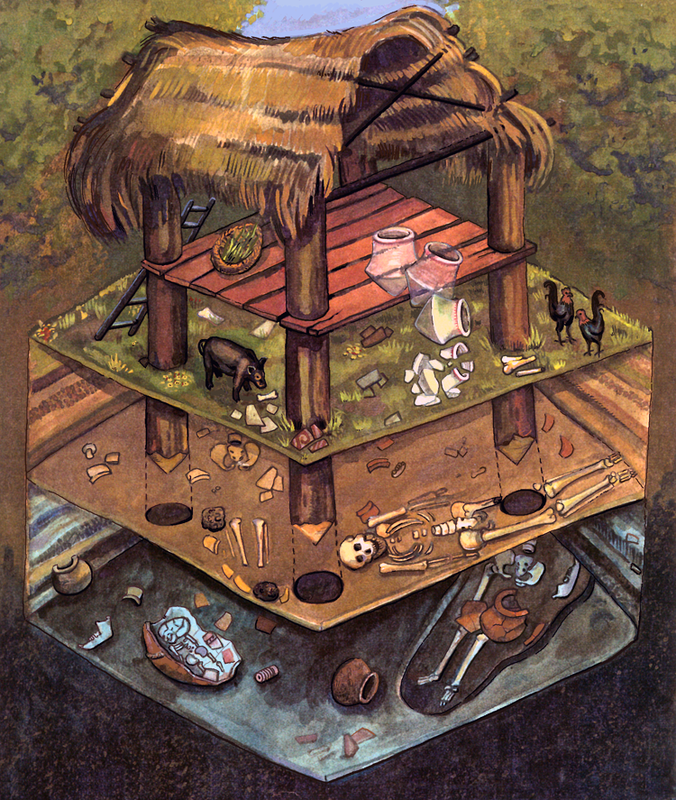 The practice of residential burial in communities where houses of perishable materials were built on stilts has meant that interpreting evidence for daily life is difficult. No intact houses were excavated, almost no activity areas were found. Instead, the remains of daily life consisted mostly of holes—probably for the posts supporting the houses and other buildings. Spreads of small pottery sherds, animal bone, and other discarded artifacts were probably refuse “kicked around” on the ground. Artifacts from daily living were most likely used on the raised house floors. Refuse was swept off the porches onto the ground below while chickens and pigs wandered about under the houses. Pottery might also have reached the ground by accidentally falling off the raised floor (hence our “Splatt” Theory). Once on the ground, the artifacts may have been further kicked about by humans and animals, coming to rest in a chaotic pattern. 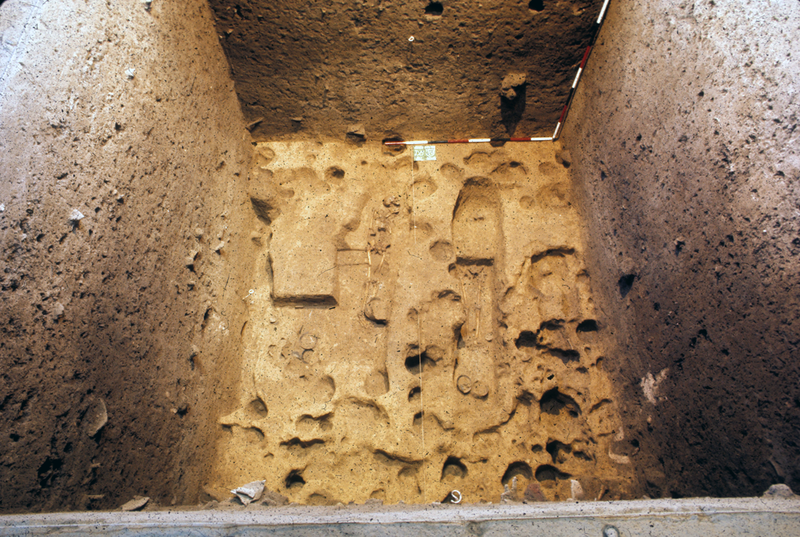 BCES Square D5 North, showing post holes intercutting with several human burials. “Residential Burial and the Metal Age of Thailand” by Joyce C. White and Chureekamol Onsuwan Eyre.